A few days ago we saw Google launching Android Device Manager to locate lost and stolen phones just like we have MyXperia app on our Xperia handsets. 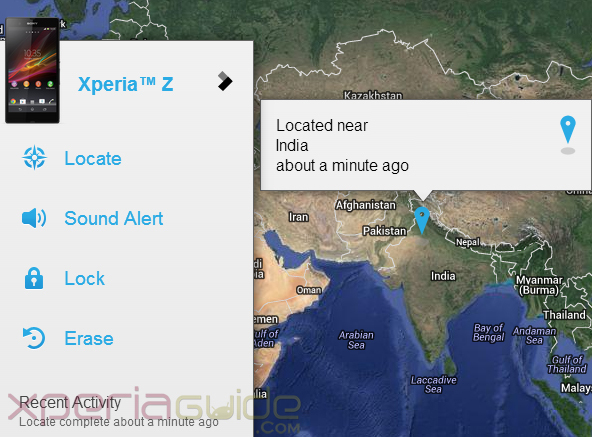 Well now we have spotted officially Android Device Manager Rolling for Xperia Phones and it is already out for Xperia Z. 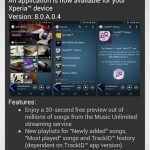 As per Google it will be available for all devices above android 2.2+. 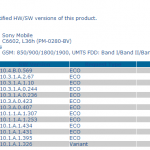 ADM also confirmed on Xperia SL LT26ii and Xperia S also. Android Device Manager is a security administrator app just like MyXperia and you should see it on your phones already rolled out or rolling in…We spotted the Android Device Manager app on our Xperia Z C6602 just now. Well let’s see you can track your lost phone via Android Device Manager. How to Open Android Device Manager ? Go to “Google Settings” app. 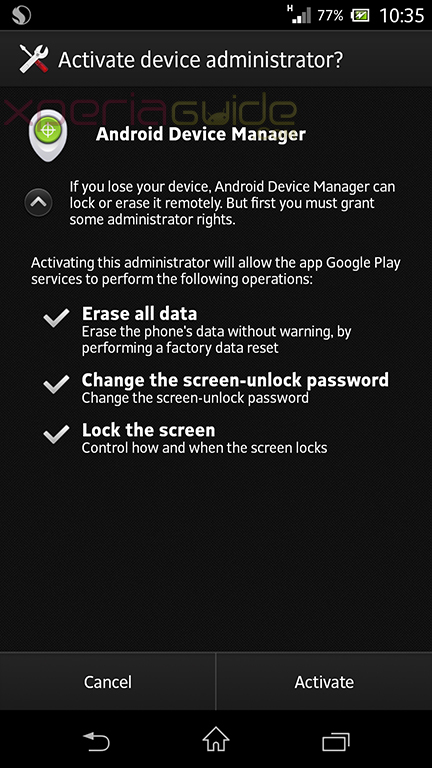 Check if you have “Android Device Manager” listed in settings option as shown in below pic. 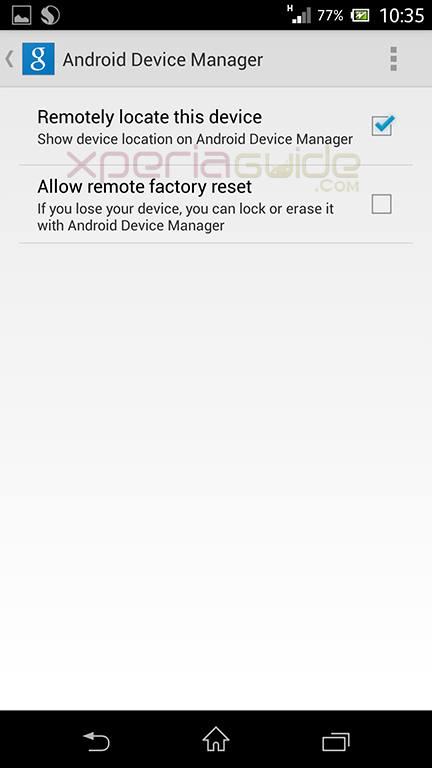 If you have “Android Device Manager’ listed than tap on it and check-mark both options “Remotely locate this device” and “Allow Remote Factory Reset”, allowing this app will enable ADM to wipe all data of phone when done by you. 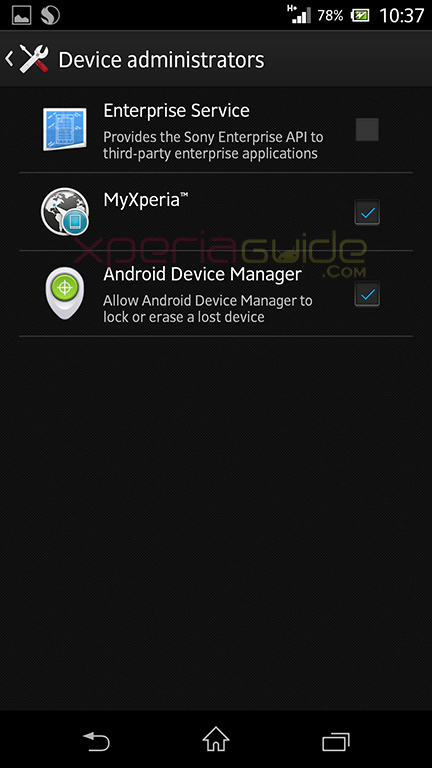 How to Activate Android Device Manager in Xperia Z / Xperia Phones ? Go to Settings > Security option of your phone. 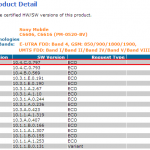 Now you will find Device Administrators listed there like “Enterprise Service, MyXperia, Android Device Manager”. 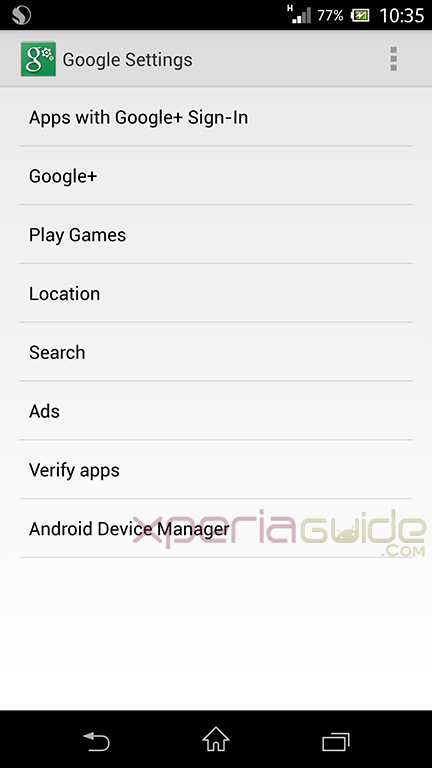 Activate Android Device Manager by checking the option. Now you have successfully activated the Android Device Manager settings on your phone. Well now let’s see how to track phone. 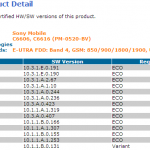 How to Track stolen or lost Xperia Z / Xperia Phone via Android Device Manager ? To track your lost / stolen Xperia Z follow steps given below. Log on to Google’s Android Device Manager Website. You will see locate option, track your device. Google Maps will point to approx location of your device based on GPS tracking. Clicking on “ring” option, you device will ring in full volume for 5 minutes, swiping through screen or pressing power button shuts the ring. Choose “Erase Device” option will remotely factory reset your phone and will protect it from any misuse. You can also edit the name of your device. When we traced our device from Android Device Manager, we got almost same location as where the device was present. Looking for the difference in application of MyXperia and Android Device Manager we found no difference in the location only that MyXperia app have more options or things to do with phone. Below you can see the tracked location as by MyXperia app. 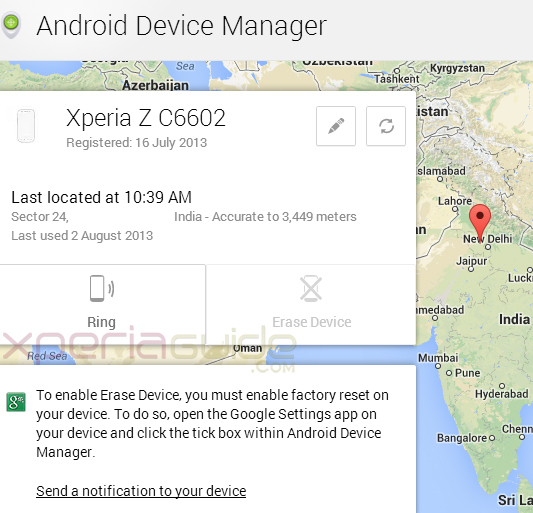 Let us know in comments if Android Device Manager has already been rolled on your Xperia Phone or not ? 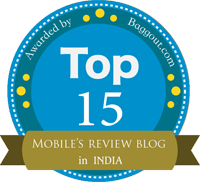 Xperia S, SL, Acro S, Ion, J,U, V,P, T, ZL, Z Ultra users please report…Do you like it over MyXperia Sony app ? 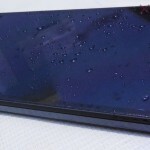 Already working on my Xperia S here in Portugal…its great !! It’s correctly worked, I tried it.